"For Rainey Sullivan, every night is a one night stand." Society is getting colder. The newest street drug jacks people into the Grid, a place of escape if you’re rich enough to afford it. Rainey Sullivan lives off the Grid. A street urchin with an unwanted talent, Rainey sticks to the outskirts of society, relying on petty theft to survive. Until one night when she picks the wrong pocket and steals more than just cash. Ghost Touch has not been tagged yet. Help others find Ghost Touch by tagging it! 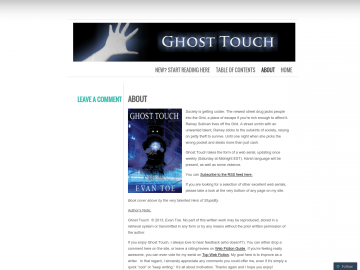 Ghost Touch has not been reviewed yet. Ghost Touch has not been recommended yet.